Scott Hochstetler, professor of music, leads the audience in a traditional Christmas carol during the 2016 “A Festival of Carols” performance at Goshen College. 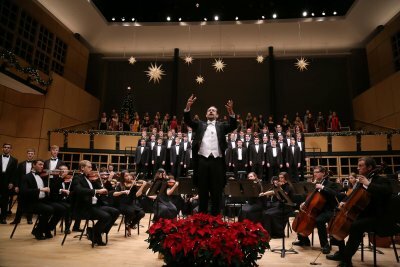 Indiana residents will have an opportunity to enjoy Goshen College’s “A Festival of Carols,” the annual musical celebration of the holiday season, on several local and regional public television and radio stations this Christmas. The 2016 performance of “A Festival of Carols” was filmed and produced by broadcasting students in the college’s communication department, and working for FiveCore Media, Goshen College’s video production company. WIPB-TV in Muncie, Indiana (channel 49), will air the performance on Sunday, Dec. 23, at 11 p.m. and on Christmas Day at 6 a.m.
WFWA in Fort Wayne, Indiana (channel 39), will air the performance on Monday, Dec. 17, at 9 a.m. and on Sunday, Dec. 23, at 3 p.m.
WNIT in South Bend, Indiana (channel 34), will broadcast the performance on Friday, Dec. 21, at 9 p.m., Monday, Dec. 24, at 9 p.m., and twice on Christmas Day at 9 a.m. and 7 p.m.
WVPE, 88.1 FM, a public radio station in Elkhart, will also air the program at 10 p.m. on Christmas Eve. “A Festival of Carols” is patterned on a traditional English worship service, and features Christmas carols, spirituals, scripture readings and works by David Willcocks, Jacob Handl, Benjamin Britten, Robert Shaw and more. Performers include the Goshen College Chamber Choir, Men’s Chorus, Women’s World Music Choir, Goshen College Symphony Orchestra and Shout For Joy Children’s Choir. The audience also joins the choirs to sing familiar carols during the performance. The 2016 “A Festival of Carols” was directed by Dr. Debra Detwiler Brubaker (Women’s World Music Choir), Dr. Scott Hochstetler (Chamber Choir, Men’s Chorus), Dr. Jose Rocha (Goshen College Symphony Orchestra) and Sandy Hill (Shout for Joy Children’s Choir). Goshen College will present the 2018 “A Festival of Carols,” on Friday, Dec. 7 and Saturday, Dec. 8 at 7:30 p.m., and Sunday, Dec. 9 at 4 p.m. in the Music Center’s Sauder Concert Hall. The Sunday, Dec. 9 performance will be streamed live at gcmusiccenter.org/live. Tickets are available for $16 by calling the Goshen College Box Office at (574) 535-7566 or visiting www.goshen.edu/tickets. Patrons are strongly encouraged to purchase their tickets in advance.